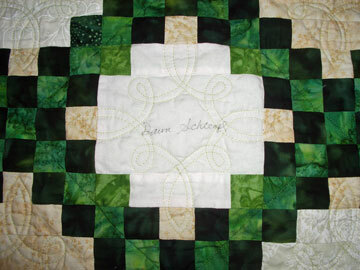 During our Irish “Sew We Go” adventure many of the quilters signed and exchanged Irish Chain blocks. I pieced mine together into a friendship top shortly after we returned… and then it sat. This past week I decided it was time to quilt it, but how? 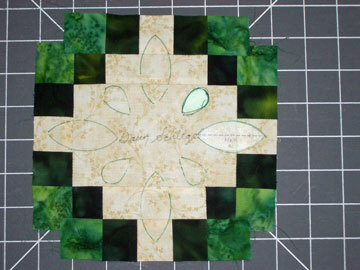 It was easy to decide to do some straight line quilting through the chains. 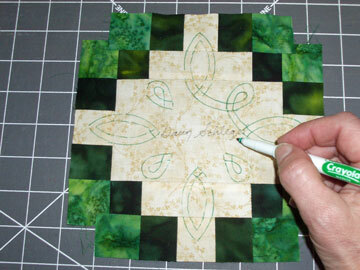 Then I felt a Celtic Knotwork motif would be nice in the signature blocks, but I didn’t have a stencil. I was pleased with what happened next and thought you might find it interesting and, hopefully, helpful. I began by pulling out my June Tailor “Mix ‘n Match Templates”™. Each package contains 6 different sizes of a chosen shape. I’ve found them to be a wonderful tool and own all their shapes, but you can also find great templates at the Craft Store. Check out the kid’s foam pieces or wood cutouts there. A few years ago it was suggested to me that quilts could be marked with Crayola Washable Markers™. I was very hesitant, but decided this would be a good time to try them. I did a test piece first and the marker washed out well. So, I used it to mark the entire quilt and, once the quilting was done, I threw the whole quilt in the washer and it came out great. I’d do it again, but I recommend testing it on every fabric it will be used on. Now I was ready to create a design. 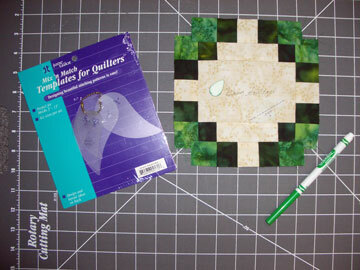 The packaged “feather” template, shown in the package above, didn’t work, but the small “leaf” template fit into the areas on the center of each side, so I drew them in. I could have connected them, but felt it needed a bit more. I couldn’t find a “tear drop” template, so I drew one of my own and cut it out. Then I traced around both templates until I was pleased with the placement of the shapes. 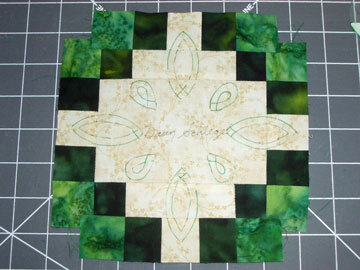 Celtic Designs usually are not made up of lines, but visual “tubes”, so I needed to “widen” my lines. I drew these free hand about 1/4″ away from the first lines inside each shape. Next, I needed to connect them and did this free hand too. You’d be surprised how easy this is with only a bit of practice! I had so many blocks to quilt that I decided I didn’t need to have the design look like it wove “over and under” at each intersection. Thus the entire block could be done as a continuous line by starting at any crossed line intersection on the pattern. The best part about creating your own design this way is that you can make it fit your project whenever you’re ready. You never need to have the perfect stencil in your stash. Have you done any of your own designing? Are there any tools that work well for you? If so, please share :-). That turned out so good. Gives us an idea of where to go with it. I of coarse am not that far yet. 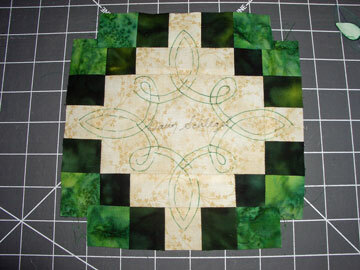 what a great way to quilt an Irish chain. Know you didn’t want to distract from the signatures, but based on your drawn green lines, I bet green quilting thread would have also looked good. It actually was a light green. The picture didn’t show it well. Looking into getting a new camera :-). Chris–love the Celtic design. I was looking for some Celtic designs recently and found “Golden Threads” in Chicago has some really nice designs. Just Google “Golden Threads” and you should be able to find the quilting website. Love your design. Will you post a picture of the entire piece? Please? A great idea on using the Crayola Washable markers. I have to try that soon. Thanks for the ideas. Thanks for the great ideas Chris. You amaze me with your creativity! Some colors don’t wash out as easily as others. Always test first!